Jayne meets Lyel, the hottest star on television, in an elevator. When the lift lurches to a stop mid-ride, they share a candid exchange before Jayne faints, waking minutes later on the floor in Lyel’s arms. It takes less than fifteen minutes for the cords of love to tighten, and Lyel pursues Jayne, having fallen utterly and completely in love. But Lyel has a secret, and after he spends three inseparable days with Jayne, he disappears into thin air. Jayne is shattered, left to mend the heart Lyel’s torn to pieces. Then, as though he’d never parted from her, Lyel returns and confesses his truth. Do you like to change up your reading? See romance from a more serious and even dark side as a tale flows luxuriously around you shimmering with atmosphere, emotion and some secrets that should never be held back? 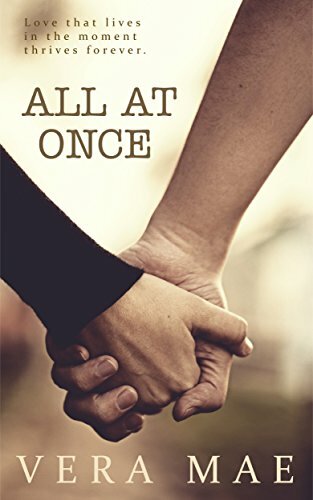 ALL AT ONCE by Vera Mae is one of those romances that everyone should to savor the feel of new love, deep connections and finally feeling complete in the arms of another person. Vera Mae does embellish her tale with the glamor of a successful and very handsome actor, a beautiful young woman who wants to be a star of the stage and traps them together on a broken elevator. But from there on out, this romantic dream belongs to Lyel and Jayne all the way as they embrace the moment and the emotions of love at first sight. Feel the clouded secret that hangs over them, the uncertainty and fear of losing something special as each must go their separate ways when the world calls. Touch the jagged shards of the sadness of Jayne’s great loss as Lyel returns to his world and fails to keep the promise he made to hang on tight to what they have. Question why along with Jayne as she uses her pain to feed her talent onstage, never knowing what she did wrong or if the Lyel she knew was just another act for the handsome actor. Will he ever come back for her? Will she ever get over him? ALL AT ONCE should be savored for the richness of Vera Mae’s words as she pens a tale that will reach deep into your soul as you watch true love come to life, falter and re-ignite in this bittersweet tale. I received this copy from Vera Mae in exchange for my honest and voluntary review.